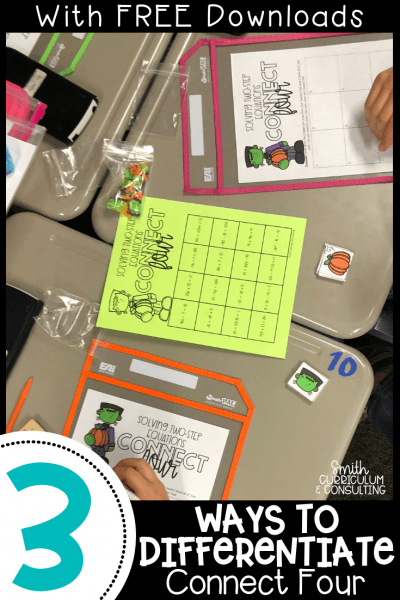 When creating my latest set of activities, Connect Four, for various topics I created a very easy to follow set of directions that made it the same throughout all of the downloads so that you could implement them easily into your classroom. 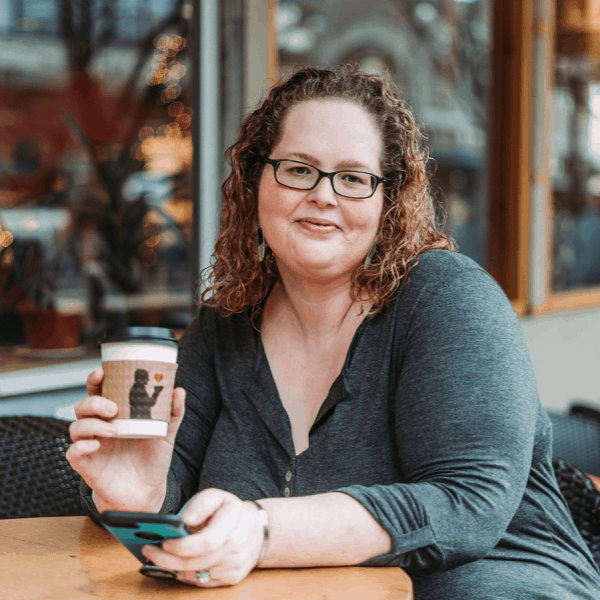 After working with the Connect Four games with teachers at a few conferences and then even working in the classroom with some students I knew I needed to share with you some easy ways to differentiate things or play the game differently. In the initial download for Connect Four you will see that it is a partner activity where students are solving problems to essentially get four boxes in a row, column or diagonal completed. All while doing this they are taking turns with their partner and playing strategically at the same time to block their partner. While this is the easiest and foremost way to work with this activity during Math Workshop there are some drawback as well. 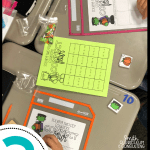 Students can either work with each other and not block therefore creating a quick game where the first person wins if their answers are all correct. This can also be an issue if the students are constantly blocking each other and then no one will “win“. This was what caused the need to create some variations that are easy to implement. The first method to differentiate Connect Four in your classroom is to continue as normal with rotating the game play with the partners but allow for four connected boxes in any which manner. 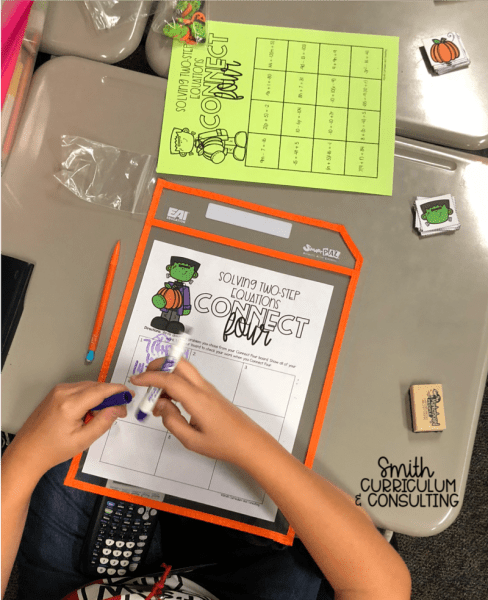 This means that as long as students are solving problems they will be able to create four connected boxes but can be in more than just a row, column or diagonal. This can still be “blocked” by the other partner but it will allow a student to easily get four boxes in a row. Another method for differentiating Connect Four would be to simply work to cover the entire board. Upon completion of the board the students will check their answers for accuracy with the Answer Key. Any boxes that aren’t correct they would remove their marker and then count their total chips to see which player wins. This mimics the game of Boxes that many of us played as children. The third method actually allows for three players to work together on Connect Four. Two of the players are working as normal to solve the problems while the third player is the Answer Key Queen (or King). 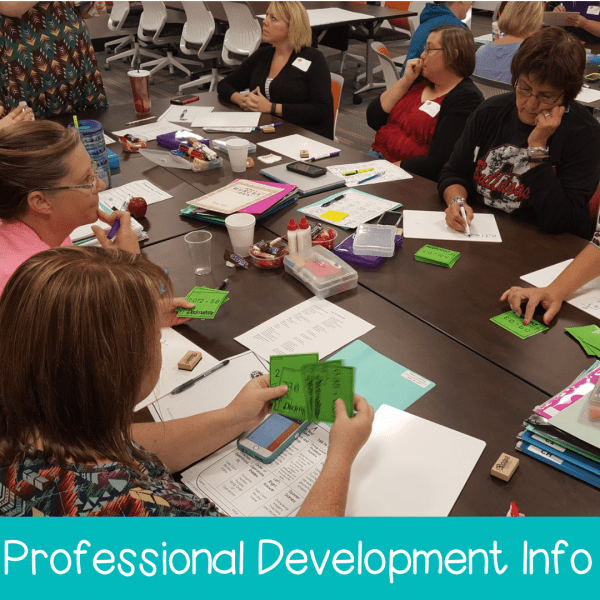 They are the one that is able to hold the Answer Key near and dear and check the problems as they go to allow students to know immediately if they are able to cover the box. If the answer if correct, they place a chip on the box. If the answer is incorrect, no chip is placed and the play continues to the next player allowing that box up for grabs. The student who answered it incorrectly can try again on their next turn if they wish. Want To Have the FREE Downloads? Because I want to make it easy for you to implement in your classroom, I have made these easy to download for you to print and use in your classroom. Each is available in color and black and white for easy printing! Just CLICK HERE to download today! I would love to see how you are using Connect Four in your classroom so make sure you tag me on Instagram when you use them!